Check out Kicking World's top performers for the 2018 camp season. We highlight the best kicking and punting prospects in the country along with videos, stats & full player analysis from Coach Brent. 2018 has been our biggest camp season ever and we can’t be more stoked for the fall football season watching all our students perform on not only Friday Night Lights, but Saturday College Game Day, and Sunday afternoon as well. One long-time student was drafted this spring, and 2 of our students were able to make it onto NFL rosters and show solid performances through pre-season. One has been named the starter going into week 1 of the NFL regular season. Already through one week of HS and College Football several students have been turning in impressive performances. Quite a few KW students have earned the starting job as freshmen not only on major FBS college football teams but also on HS Varsity teams, which is unprecedented! It all comes down to trusting a process and following it the same way every single day without veering away from it. If you do the right things, follow what you’ve learned, and put in the hard work when no one is watching; good things will happen for you too. 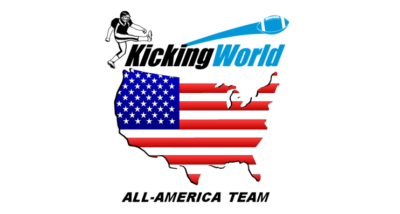 In this article we highlight the top performers from Kicking World across our entire 2018 camp season thus far, where we’ve made stops in over 22 states. Through September 1st, so far 54 National Showcase invitations have been earned, and we’ve seen over 1,000 campers. As always, our season-ending National Showcase event will draw the best specialists from across the nation. We invite the top 5-10% of talent each year which helps ensure those in attendance get maximum eyeballs and real traction in their college football recruiting efforts. In fact, in the last 4 years of our invite-only National Showcase, over 25 offers were received within 2 weeks following the event! So far this season two campers earned a spot on our exclusive Hot Prospect List that is currently made up of less than 20 of our best prep recruits from around the country. Congratulations to Class of 2021 kickers from Ohio – Joshua Montanari (Theodore Roosevelt HS) and Christian Roig (Midview HS). Both had impressive performances at our 2017 National Showcase event and then again at our June 2018 Cleveland, OH 1-Day camp hitting 58+ yard field goals and 68+ yard kickoffs in the 3.9+ second hang time range, along with some excellent punts. We are expecting them to dominate their junior seasons and get on recruiting boards this fall. Aaron Rodriguez (Hart HS, CA) has excelled at University run camps this summer, winning the USC, Stanford, and Washington State punt competitions! He hits a beautiful punt consistently in the mid 4 second hang-time range, with the ability to break 5.0 seconds. Aaron finished in the top 3 of all punt competitions at our 2017 National Showcase event. Aaron is a Division 1 level punter and is well deserved of offers from the top level. Landon Reeves (Idalou HS, TX) comes from a small school in West Texas near Lubbock. He’s a 3x National Showcase attendee and a long-time loyal Kicking World student. He’s always had a great leg, but this year as a senior he kicked it up a few notches and excels at all three – Field Goals, Kickoffs, and Punts. He gets excellent trajectory on his field goals, and hits some deep kickoffs and punts. He’s a kicker with the potential to excel in college. Our longest tenured Hot Prospect, Jared Zirkel (Tivy HS, TX) has been on the tear this summer. He outright won Texas A&M University’s kickoff competition with a monster 74 yard / 4.2 second bomb. He’s a 3x National Showcase attendee, 5x Kicking World kickoff competition winner, and 3x Golden Boot champion. Jared can do all 3 – field goals, kickoffs, and punting. He has been hitting 55+ yard field goals since his freshman year and now as a junior he’s hit 65 multiple times, and I feel on a good day he could hit a 70-yard field goal. From what I’ve seen Jared has the strongest leg in Texas and perhaps even in the country as far as current high school kickers go. RIGHT NOW he could walk on to an FBS roster and win the starting kickoff job. Trey McTaggart (Muenster HS, TX) finished his 2017 season a perfect 100/100 PATs! That many PATs in one season is unheard of, and to go 100% on that many kicks is simply remarkable. He also knocked through 3/3 FGs and 2/2 PATs in his state championship game at AT&T (Cowboys) Stadium. The 5’6 HS junior kicker has one of the fastest legs we’ve seen over the years, which helps him generate speed and power into his kicks. At our July Dallas event, he was hitting 53-yard field goals with ease, and knocking his kickoffs deep into the end zone with 3.8+ second hang times. If Trey can put together a performance similar to last year’s season he should start getting early offers this year. Get him out for a visit ASAP if you need a reliable field goal weapon. Steven Opella (Reagan HS, TX – 2019) had an impressive 2018 camp tour with Kicking World where we saw him hit multiple 55+ yard field goals, and finish at the top of the pack in both FG and Kickoff competitions. Cayden Camper (Pueblo County HS, CO – 2019) – this 6’5 athletic 2x National Showcase attendee and 3x Kicking World punt competition winner turned in an impressive summer University camp tour. He won the FG competition at Colorado State, as well as 2 other college’s punting competitions. Cayden has faired well at our camps, particularly in punting – hitting mid to high 4 second hang-time balls. With a little more overall consistency he should be picking up offers this fall. He is a Kicking World ‘On the Cusp‘ Prospect. Houston Heck (Panhandle HS, TX – 2020) excelled at our May 2018 Oklahoma City camp. He hit several punts in the high 4-second range and did it with humility. We’re looking forward to seeing him do it again at our 2018 National Showcase and increase his collegiate options. Brian Cooey (Highland Regional HS, NJ – 2019) separated from the pack on punts at our August 2018 North Jersey camp. Punt after punt he would hit mid 4 second hangs / 50+ yard net balls. He even connected on a few 5.0+ punts. Brian has faired well at University run camps this summer and will further increase his exposure and should snag new offers with a solid performance at our National event in December. With the 2018 Camp season completing this month, there are only 2 events remaining to potentially earn a 2018 National Showcase invitation. Join us on September 16th in Dallas, TX for our ‘open’ Southern Regional Showcase for classes 2019-2023. Overall competition winners for each FG/KO/P competition at this open competition-only event will earn an automatic invite to the National Showcase. And our last camp of the 2018 season is on September 30th in Austin, TX, a traditional 1-Day camp perfect for a mid-season tune-up. Our season-ending National Showcase is streamed live on YouTube and every college football program is well aware of the talent draw of this special event. In the last 4 years of our invite-only National Showcase, over 25 offers were received within 2 weeks following the event! View our freshly updated Hot Prospect List which comprises the top ~3-5% of HS kickers and punters from across the country. The updated list now also displays select ‘On the Cusp’ students. View competition results from every 2018 Kicking World Camp and see where you stack up. We take pride in connecting with our students on a personal level, knowing every camper’s name and making a positive impact on their football career and guiding them into becoming accountable young men. College coaches place a much higher value on our recommendations because they know we spend time with each student and get to know the person as a whole, not just if they have a strong leg; we evaluate character, reliability, poise under pressure, form, fundamentals, having a duplicable process, and a lot more. Coach Brent e-mails the Hot Prospect List and ‘on the cusp’ recruits 4 times a year to every College football program to help Kicking World campers get noticed. He also remains in close contact via text, e-mail, and phone with hundreds of college football coaches throughout the country. Becoming a Kicking World Hot Prospect is the highest honor a highs school specialist can achieve. It provides an immediate recruiting boost and maximizes eyeballs for that student. Be sure to check out our Hot Prospect FAQs on the Hot Prospect List to see why you need to make this list if you want to accelerate your college football recruiting efforts. Find a Camp and get started today.